The Giants are trading for Yastrzemski; well, a Yastrzemski. 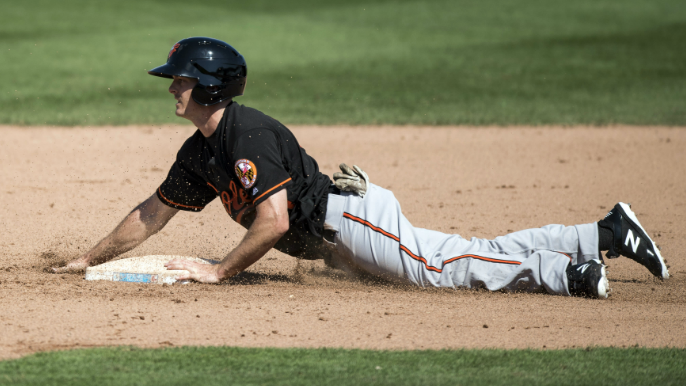 On the final day of the Cactus League season, a day which is already chockfull of roster moves, and likely has more to come, the Giants made a move for an outfielder: Mike Yastrzemski. In exchange for the 28-year-old Yastrzemski, who has not made a Major League appearance in his six seasons in the minors (a career .260 AVG/.337 OBP/.428 SLG with 61 home runs and 338 RBIs in 663 minor league games, and .265 with 9 home runs and 49 RBIs in Triple-A last season), the Giants traded minor league pitcher Tyler Herb. Herb, 26, who was a 29th round draft pick by the Seattle Mariners from Coastal Carolina University in 2014, had a 5.35 ERA with the Triple-A Sacramento River Cats last season in 70.2 innings. Yastrzemski was a 14th round pick back in 2013 from Vanderbilt University where he finished First Team All-SEC in his final season. Giants traded minor league RHP Tyler Herb to the Orioles for OF Mike Yastrzemski. Yaz is going to minor league camp. If you were wondering, yes, Yastrzemski is related to the Red Sox Hall-of-Famer Carl Yastrzemski. Carl is Mike’s grandfather. Mike Yastrzemski is the grandson of Carl, by the way.